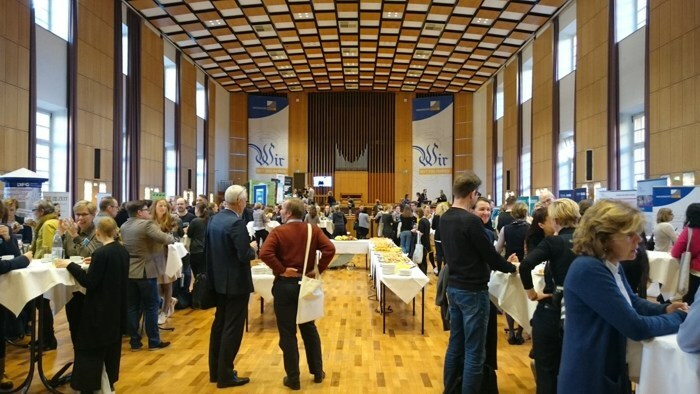 The German eleventh Forum on Science Communication came to my home town, which was a good occasion to spread the word on Climate Feedback. I could write several blog posts inspired by this meeting, which is good and I might, but this post is just about the opening speech by Prof. Dr. Julika Griem, the vice president of the German Science Foundation (DFG) and the Director of the Institute for Advanced Study in the Humanities. Julika Griem slaughtered a few holy cows in front of the vegan science communication folks who were talking about this until the last session. The conference offered a wide range of backgrounds. Well-dress communications people with slick rehearsed talks, natural scientists like myself in t-shirts freely speaking inspired by power point bullet points, journalists in the middle and Griem gave the opening lecture in humanities style by reading a written out text. I would have preferred to read myself, to be able to stop and think, so I was happy when they posted the text (in German). People who survive a humanities eduction deserve a medal. Prof. Griem asked several controversial questions. Is it really such a good idea to focus so much on story telling, adventures, heroes/personalisation and simplifying? Isn't describing, explaining and argumentation better suited for science? Especially modern science is about working together in large groups with many specialised scientists in which management, administration and technical infrastructure are important. Documents, data and instruments are harder to turn into heroes than individuals. 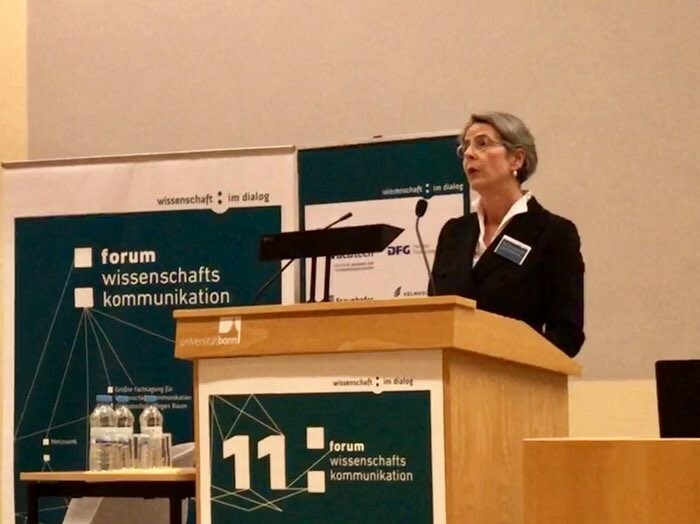 Prof. Dr. Julika Griem speaking at the Forum on Science Communication. 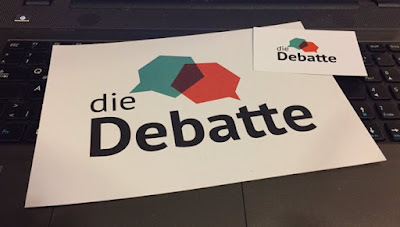 Later at the form, the group The Debate, which organises science debates all over Germany, noted that their audience missed talking about the process, how we do science, why we are confident about certain results? While in science journalism it is common to focus on the results themselves and on people. Related, but not from the conference, is that I discovered Street Epistemology on YouTube. With this method it is possible to reasonably consistently have friendly conversations about hard topics, even about religion, which you are normally not supposed to talk about because it so easily escalates. The Street Epistemology strategy is: 1) do not attack the person, 2) do not question the conclusion (closely tied to identity), but 3) do talk about methodology. In that respect it fits well into the above suggesting to communicate better how we do science and why we know what we know. As scientists we talk about methodology all the time and we are normally able to have productive conversations at scientific conferences even though scientists come from a wide range of culture and backgrounds. However, outside of science we hardly talk about methods. Especially the media is very focused on people & conclusions. Maybe we should do this more and see if Street Epistemology (SE) also works to get a friendlier chats on climate change. The first video below give an example of an SE conversation, while the second explains the idea in more detail. We should not forget in this debate that scientists and journalists have different interests. For a scientist quality is much more important than quantity (number of readers). When I give a talk it is not important whether 10 or 1000 people are in the audience, if there is one expert in the audience who will build on my work it was a success. A former journalist once did a short media training here in Bonn. He wanted us to do exactly what ever journalists want us to do. He was utterly disappointed when I told him scientists have their own interests, he complained I had not been listening. I did, and it is good to know what your counterpart wants to try to find the best compromise for both, but I do have my own interests. Griem also did not like hero stories as the lone warrior recalls the same anti-institutional feelings of anti-science critics. Stories where technocrats and bureaucrats at universities, in Bonn (where her DFG is) and in Berlin (politics), hold back intrinsically motivated people to do ground breaking work. I would see that as a reason to like hero stories, trying to make institutions better is the opposite of being anti-institutional and there really is enough to complain about, from publish and perish, to funding science based on short-term projects rather than on long-term relationships with people and institutions. Project-funded science stifles innovation and waste enormous amounts of work in writing proposals, in managing them, and in each time building a new group. Time and energy that could have been spend on doing ground-breaking research. Prof. Dr. Julika Griem proposed that science communication should tenderly overstrain the public. That does not sound like a good general strategy. It would lead to misunderstanding and would limit the audience interested in science even more. However, it is good to have a range of strategies and publishing a tenderly overstraining book like [[Gödel, Escher, Bach]] also belongs to science communication. Interview with me on Climate Feedback (in German): When researchers look the press over the shoulder. Wenn Forschende der Presse auf die Finger schauen. Climate Feedback, a group a climate scientists who review media articles on climate change. > Is it really such a good idea to focus so much on story telling, adventures, heroes/personalisation and simplifying? No, it's a really bad idea. But it's also a rather obvious one, so if anyone was surprised I'm surprised. But while you note her asking the question, you give no hints as to how she expanded on it, or how people answered it. I am not sure whether story telling is really a bad idea. It also has its advantages, people like stories and find them easier to remember. Thus they are more likely to engage with science if we tell stories. But we should not be blind to the downsides and use a mix of strategies. On my little blog I have the luxury that I do not have to care about the number of readers. > Especially modern science is about working together in large groups with many specialised scientists in which management, administration and technical infrastructure are important. Documents, data and instruments are harder to turn into heroes than individuals. The response was mostly a simple rejection: we want/need to reach an audience so we simply need story telling.